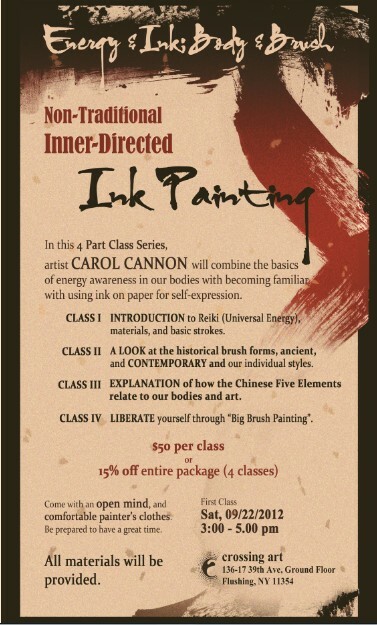 Carol is Teaching A New Ink Painting Course! I am happy to inform you all that Group member and artist Carol Cannon is teaching a series of four classes in Queens starting Saturday afternoon, September 22, 2012. Below is the flyer and her complete syllabus is below that. I am quite sure that anyone who attends is in for quite an expansive treat! In this 4 Part Class Series, we will combine the basics of energy awareness in our bodies with becoming familiar with using ink on paper for self-expression. By learning about Reiki (Universal Energy) as a system for self-healing and the qualities of our tools – ink, paper, and brush – an unlimited and timeless path is opened for centering, transcendence and creativity. With the focus on process more than product, we learn how to be grounded in the moment, in our bodies, listen to and connect with nature and our authentic power. Each week we will go deeper, paint larger, and find more freedom as we drop pre-conceived ideas about art and let universal energy flow through us. Come with an open mind, comfortable painter’s clothes, and be prepared to have a great time. All materials needed will be provided for use in class. Class I: Introduction to one another and Reiki (Universal Energy) and the use of our materials: brushes, ink, and paper. 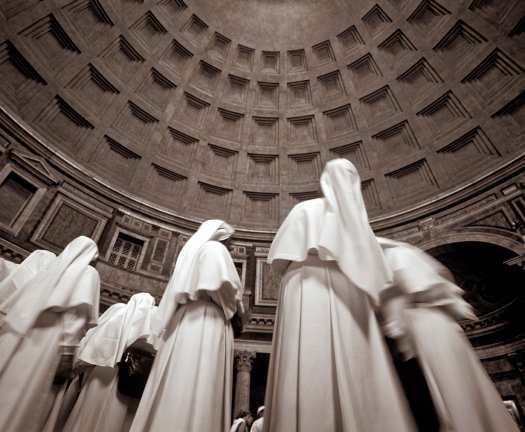 Explanation of the lineage of the teacher’s knowledge, resources, and demonstration. We all begin painting by centering with Reiki first, doing basic traditional brush strokes and then a closed eye painting exercise. Class II: A look at early pictograms, Eastern and Western calligraphers and painters, ancient and contemporary. We discover the different brush forms, discussion of importance of each individual’s “fingerprint”, and work time with specific musical moods to vary our strokes, textures, and visual rhythms. Class III: Where we are in the cosmos today and what this means for us as individuals, artists, and our society. Explanation of the Chinese Five Elements and how they relate to our bodies and our art. Water Element Meditation and work time. Class IV: Introduction and demonstration to “Big Brush Painting” from sitting and standing positions. Earth Element Meditation. Students then work in coupled formation while others observe in silence. Questions and sharing. We will close with a simultaneous “Group Stroke”. This entry was posted in News About the Group and tagged Carol Cannon, Crossing Art, Energy & Ink; Body & Brush. Bookmark the permalink.